Our hydrogen generation technologies provide the ability to deliver pure hydrogen from a wide range of currently available fuel supplies. A clear competitive advantage The ability to integrate clean power technology within existing fuel distribution networks - the critical missing part of the solution for much of the competition - allows us and our partners to deliver the hydrogen technologies of the future, today. Fuel compatibility Furthermore, our proprietary desulphurisation process provides compatibility with 'dirty' fuels where and when necessary, e.g. for demanding military applications. Simplicity and flexibility Delivering pure hydrogen through integration with our hydrogen purification technologies means much simplified and flexible system integration with hydrogen storage systems and fuel cell power trains. The power to deliver We've developed a portfolio of hydrogen generation technologies with a power range spanning a few tens of watts through to tens of kilowatts. This means we can deliver across a range of power uses, from remote surveillance to grid support applications. These technologies have been designed from first principles to provide compact, cost-effective and scalable hydrogen generators. We've done all this through a combination of in-house development and working in collaboration with strategic supply partners. 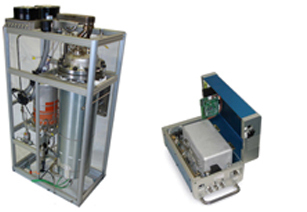 The Hestia scalable hydrogen generator (left) and the compact Meso hydrogen generator (right).